Katie Meek is the owner and creative genius behind Meekly Yours. Ahead, she shares how her experience in content marketing helped her launch her own creative business, two great resources for expanding your skill set, and reminds entrepreneurs to be authentic . 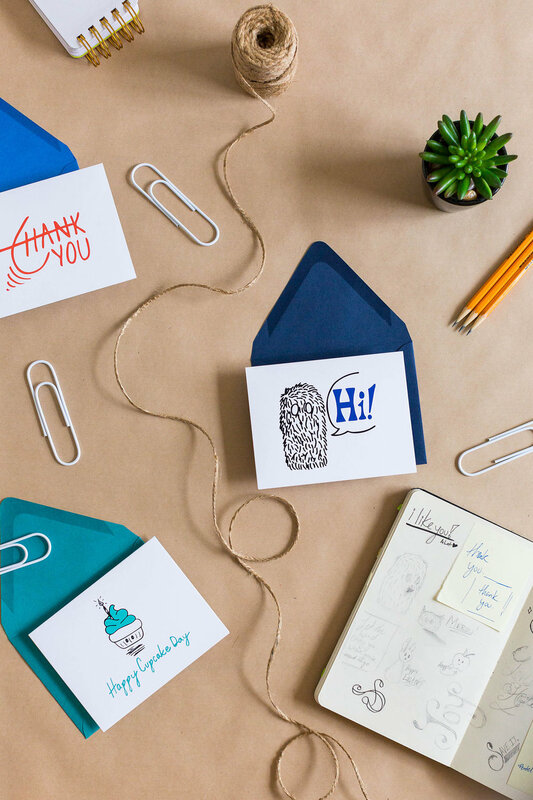 . .
Meekly Yours is a graphic design, hand lettering, and illustration studio that creates unique, whimsical designs. I strive to include bright colors and positive messages in my designs to help bring the same joy to my customers and clients that I feel when creating each design. I am a South Carolina native and have lived my whole life on the on East Coast—minus a short stay in London. I moved to DC for college and have stayed ever since. I am naturally curious and love to learn about the deeper meaning of the world around me. I try to bring that curiosity into my work with clients and in developing my own designs to bring out the best solutions. In college, I majored in graphic design which solidified my of print design. After graduating, I landed in the world of content marketing, print production, and project management. I got great experience working with my teams and clients, but my work didn't provide the creative outlet I needed. I started experimenting with hand lettering phrases and drawing my own graphics. I loved being able to create ideas from scratch and bring them to life. Soon, I started turning my work into physical pieces for sale. I continue exploring new ideas, techniques, and mediums to broaden my skills and stay inspired. I'll start with the best part. I feel most inspired and productive when I work with clients on commission pieces. Seeing their joy and excitement for their ideas brought to life is priceless. Each client and project is unique, and I really enjoy exploring the challenges and opportunities that each one brings. On the other hand, it can be a challenge to stay focused and motivated. Although having control over my own schedule is a wonderful freedom, I frequently prioritize tasks that are more enjoyable but are less important to growing my business. Sometimes taking a break from my apartment to work in a coffee shop or co-working space helps me stay focused by surrounding me with other's productivity. Having goals—big and small—help me to stay motivated to work and grow my business. A couple of my ongoing goals are to develop my skills and to make more connections that can lead to great partnerships. I try to attend as many classes, workshops, and industry events to meet like minded people and expand my own abilities. The Rising Tide Society has had a big impact on my business. Seeing the great work that other creatives are producing motivates me to keep working, and the connections I have made through our Facebook group and in my local Tuesdays Together group have been invaluable to learning how to work better and smarter. As an avid reader, I wish I could say I spend more of my evenings reading late into the night. However, most nights are pretty low key, and I decompress by watching Netflix with my husband. It's an opportunity cuddle up together and let my brain slow down naturally before heading to bed. what's one piece of advice you'd give to other entrepreneurs? Don't try to be everything to everyone. Think about what makes sense for your business whether it's a new product, social platform, or business philosophy. Even though something may be “what everyone is doing” doesn't mean that it will work for your business or your clients. Explore options and opportunities, but don't forget what makes your business work. Thank you so much for sharing, Katie!